"Wild Area! Zoomway! Habitat! Outsiders! Strange names in a strange world which was evolved in a great natural cavern beneath modern America! This is the world of the "Project" -- where the Secret of the Century has been kept! The Harnessing of the DNA Molecule!!!! The Breaking of the Genetic Code!! MAN EXPERIMENTING WITH LIFE!!" To comic fans "in the know," this bombastic passage from Jimmy Olsen no. 137 said the same thing as a cover blurb on an earlier issue: "Jack Kirby Is Here!" Wherever Kirby went, you could count on certain constants: an endless stream of wild new concepts, a meld of almost-possible science with "Get outta here" fantasy, and a writing style that threatened to bankrupt the world of all its exclamation points. No mere bank robberies or kidnappings in a Kirby story: the stakes were always global survival...at least! That Kirby was exercising his patented formula at DC Comics...in of all books, Superman's Pal, Jimmy Olsen, was perhaps the wildest twist of all. Today, artists and writers hop between publishers without raising an eyebrow, but in 1970 the very idea of Jack Kirby leaving the hip, happening Marvel Universe he co-created for the staid, "establishment" halls of DC was mind-blowing. Such things just were not done! Then again, Kirby had a way of making his own rules. Defecting to DC, he cashed in his enormous clout as a creator by persuading the company to launch not one but three new titles to showcase his epic "Fourth World" saga; New Gods, Mister Miracle and The Forever People. From what may have been comics' first "imprint line" came such concepts and characters as Darkseid, Orion, Mister Miracle, Big Barda, Apokolips, New Genesis, the Boom Tube, Mother Box, the Anti-Life Equation and more, many of which continue to influence the DC Universe to this day. Monsters, clones, hippies, nuclear meltdowns and...Don Rickles? KirbySays: "Don't Ask, Just Buy It!" Jimmy Olsen became the unofficial fourth corner of the Fourth World, as Kirby transformed the dull-witted cub reporter into a rough-and-ready adventurer in the mold of the Challengers of the Unknown. Under Kirby's guidance, Jimmy became a leader of men, a bold hero in his own right and -- by virtue of his age -- our liaison to an incredible secret world of super-hippies with the wardrobes of beatniks and a technology to rival Krypton's own. One can only imagine the amazement of readers who picked up issue 133 expecting more of the same "how do I impress Lucy Lane...oops I've turned into a giant turtle" goofiness, and finding instead an outlaw biker gang, the space-age "Whiz Wagon" and a Jimmy Olsen ready to tune in, turn on and drop out! It was almost as unimaginable as Archie Andrews quitting Riverdale High to follow the Grateful Dead. Click for a better view of this groovy trip, man! Kirby showed his fascination with America's "youth culture" (or maybe just his eagerness to earn their business) by introducing bizarre hippie-like slang, mod fashions and dreamy psychadelic imagery. In issue 137, a gadget called the "Solar Phone" enabled Superman, Jimmy and a room full of young people to take a group "mind trip" through a realm of groovy images and (we're told) sounds and sensations. It's a perfect Kirby "cheat": Superman would never take drugs, but he does "do" science, and the Solar-Phone is the electronic equivalent of an acid tab (It's also a good chance for Kirby to show off his new mastery of the photo montage). Although some of the young people (Outsiders, Forever People and "Hairies") think Superman's pretty cool (and hunky! ), he's really only welcome because he's "Jimmy Olsen's Pal" (a neat twist) because, after all, you can't really trust anyone over 30, even if he does wear the big red "S."
Nonetheless, when it comes time to feature a real-life celebrity in the book, Kirby opts not for Janis Joplin, Jim Morrison, Timothy Leary or another icon of the counter-culture, but instead for the (then) middle-aged Vegas comedian Don Rickles (!) who appears not only as his vitriolic, mean-spirited self but also as an insufferably nicey-nice doppleganger named "Goody Rickles." Hmm...maybe Kirby left that Solar Phone on a bit too long! Just to keep the kookiness rolling along, the cover blurbs featured such unconventional (or just nutty?) exclamations as "Don't Be Chicken, Read All About DOOMSDAY!" and "Kirby Says: 'Don't Ask, Just Buy It!'" Below: Superman "family member" Perry White gets a Murphy Anderson head; Kirby creation Terry Dean doesn't. Of course this was all over my head at the tender age of 6. All I knew was that the "Four-Armed Terror" in Issue 137 was just about the scariest thing I had ever seen (I still get goosebumps! ), and that Kirby's Superman seemed fit to burst with power, compared to the laid back, reserved Curt Swan model. Even as a first-grader I knew this version of Superman was wildly different from the rest. In fact it was so different that DC worried readers might be scared off. In a still-controversial move, they had the heads of all Superman "family" characters re-drawn (or at least inked over) by established Superman artists Al Plastino and Murphy Anderson. Many Kirby fans have been outraged over this on his behalf, but the artist himself seems not have minded much. Personally, even when I got old enough to know the difference, I wasn't about to complain. Whereas I loved Kirby's machines and vehicles, and his phenomenal fight scenes, I never much cared for his faces, which often seemed hard and glowering, with their heavy brows, broken noses and those weird squiggly lines that made it look like everyone's epidermis was sheathed with a thin layer of lucite. With Kirby handling designs, layouts and poses, and the DC "bullpen" adding handsome faces, I had the best of both worlds. Anyway, it beat having Superman inked by the dreaded Vince Colletta, whose inks elsewhere in the book (and on other Kirby works) could most charitably be described as "merely adequate." Kirby's contributions to the Superman mythos came as much through his writing as his artwork. Plots centered around "The Project," a secret underground complex with nebulous governmental connections and dedicated to cracking the human genetic code. Results of these almost heretical experiments included the resurrection of Kirby's Golden Age hero The Guardian (actually a clone of the original), the introduction of Kirby's "DNAliens" and many disturbing mutations of humanity in miniature, gigantic, superhuman and monstrous forms. Pretty amazing stuff for 30 years ago, and more timely than ever given today's headlines. Kirby dealt with the possibilities -- both good and bad -- offered by man's mastery of genetics, and raised serious ethical questions in the process. As with much of Kirby's work, the Jimmy Olsen run showed science as both our salvation and our potential ruin. Hallmarks of Kirby's Superman: Speed (left) and strength (right). Ultimately, Kirby's run was fairly brief, but it left a lasting mark on the mythos and on the next generation of creators. Elements from the series have cropped up in the post-Crisis Superman books (notably Project Cadmus, DNAliens, Dubbilex and The Guardian) and on the recent Warner Brothers animated series, to wonderful effect. A few years after Olsen, in his comic Kamandi, Kirby dealt with the legacy of Superman, as "the Last Boy On Earth" encounters a race of intelligent apes who worship Superman's costume and await the day he will return to claim it and save the Earth from post-Apocalyptic chaos. Interesting here is the fact that Kamandi comes to revere the outfit himself, and believes Superman will indeed fulfill the prophecy. It's the sort of "superhero as modern-day god" story that Kirby did so well. By the mid-70's, Kirby was back at Marvel for a new take on Captain America and experimental concepts like Machine Man and Devil Dinosaur. Later still, he would be an early player in the emerging independent comics market with several new creations. His work on Superman was limited to the mid-80's "Super-Powers" miniseries (where he was allowed to draw Superman's head at last!) and the occasional "pin-up" for special anniversary issues like Superman no. 400. 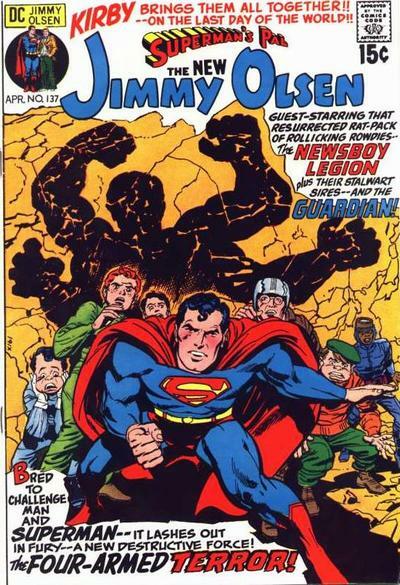 But in most minds, Jack's best Superman work remains those issues of Jimmy Olsen. In fact, while most of the artists on my "favorites" list are here because of their pencilling or inking styles, Kirby is more an "artist" in the classical sense: he's a creator with a remarkable sense of vision. Like other great "artists," be they writer, sculptor or performer, his "art" is uniquely personal and instantly recognizable, with a message that resonates with audiences of many generations. Those of us who were around see Kirby take the confident, easy-going, and -- yes -- even dull Superman of 1970 and throw him headlong into a Marvel-like realm of action, terror and cosmic adventure can only daydream about what might have been, had he taken on Superman and Action Comics. But now, of course, we'll never know, as "King Kirby's" no longer with us, except through the many wonderful stories he's left behind. Long live the King! 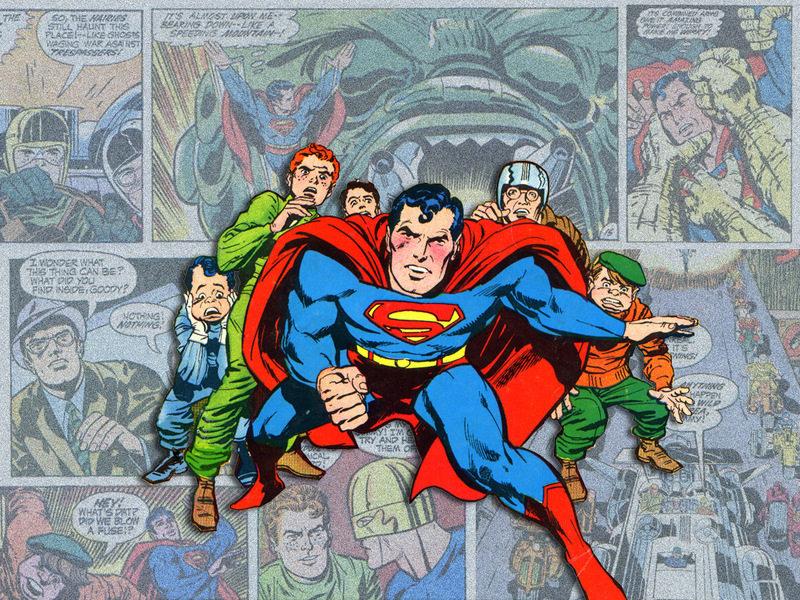 Relive the Jack Kirby Superman experience with my home-made wallpaper, featuring some of the wondrous and amazing concepts introduced in the pages of Jimmy Olsen! This fan-run web-site is neither authorized nor endorsed by DC Comics, Warner Brothers, nor the Siegels. 'Superman' and 'Supermen of America' are TM DC Comics, 'Superman'© DC Comics, Joanne Siegel, and Laura Siegel Larson. Superman created by Jerry Siegel and Joe Shuster. 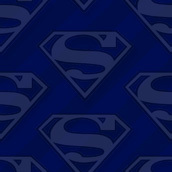 CLICK HERE to visit the official Superman site.